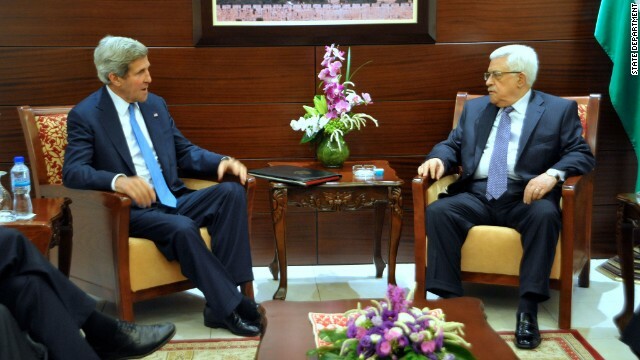 Secretary of State John Kerry meets with Palestinian President Mahmoud Abbas in Ramallah on Friday. The long-dormant Middle East peace efforts got new life on Friday. An agreement has been reached that "establishes a basis for resuming direct final status negotiations between" Palestinians and Israel, U.S. Secretary of State John Kerry said in Amman, Jordan. "This is a significant and welcome step forward," Kerry said. This came as Kerry visited the Middle East this week and came up with a formula for reanimating peace talks between Israel and the Palestinian territories, a source close to the talks said. I'm just curious to see, when Kerry brings the Middle East peace talks to Washington, if Obama will eventually be the one to confirm the 7 year covenant. I'm still sayin', there's a pretty good chance Obama is the antichrist. How else can a man gain all this power and prosper, yet be so inept and destructive at the same time? Simple keep voters stupid and on the government hand outs. Historicly the Isrealis,Palestinians are more than just neighbors because they both came from the same Egyptian blood thousands of years ago..You'd never think it the way they go at each other like the Hatfields and McCoys..Both are just arrogent countrys that live off our foriegn aid in which they'd never exist without it would they! !America should just step in and make it easy , either cut the crap and coexist or do it without our help which includes cutting foriegn aid and see just what happens.That's what diplomacy is all about when to be easy and when to be tough and its time America to be tough isn't it!! Well, they're neighbors. Unlike Palestine, Israel is a developed country. Is Palestine interested in doing some business with Israel on the projects of exporting labor services? Is Israel interested in doing some projects of importing labor services? Principles and disagreements are not the food anyway. please keep Kerry over there to monitor peace between Palestinians and the Israelis. Oh boy the Palestinians can promise peace then the rockets will be flying before the sunset. Of course everyone will blame Israel for protecting itself. Time to start a crap storm.A lack of cooperation is most apparent in the failure of all Muslim armies to succeed at combined arms operations. A regular Jordanian army infantry company, for example, is man-for-man as good as a comparable Israeli company; at battalion level, however, the coordination required for combined arms operations, with artillery, air, and logistics support, is simply absent. Their Culture is their worst enemy. There is no individual who would stand out because they are afraid to make a mistake. Unless Muslims have overwhelming numbers will they act. When you combine Muslim culture with military it becomes ineffective. Arabic-speaking armies have been generally ineffective in the modern era. Egyptian regular forces did poorly against Yemeni irregulars in the 1960s. Syrians could only impose their will in Lebanon during the mid-1970s by the use of overwhelming weaponry and numbers. Iraqis showed ineptness against an Iranian military ripped apart by revolutionary turmoil in the 1980s and could not win a three-decades-long war against the Kurds.The Arab military performance on both sides of the 1990 Kuwait war was mediocre. The Arab army was a joke in gulf war we had to soften the target up and herd them in. Im not even sorry to say this.